Advent symbolizes the present situation of the church in these “last days” (Acts 2:17, Hebrews 1:2), as God’s people wait for the return of Christ in glory to consummate his eternal kingdom. The first week of advent focuses on hope. Hope that we have even in hopeless situations. Hope that came in the form of a baby boy born to Mary and Joseph in a humble manger. Good news of great joy. A message of hope that our world, torn by war, hatred, division and poverty so desperately needs. As I write this I think of my brothers and sisters throughout the world that are facing great suffering and persecution, some who this year remained faithful to the testimony of Jesus Christ even unto death. My heart breaks for the suffering and hopelessness of many, who live in the grip of poverty, addiction, and violence, places where hope is hard to find. I pray for my family and the families of others,who do not yet know Him, who have not embraced the hope He offers. But, I am not hopeless even in the midst of all these things, that tell us our world is not right, yet, and point to what is to come. Over two thousand years the message of hope rang loud and true, and it rings out still today. We can have hope. Hope for today. Hope in eternity to come. 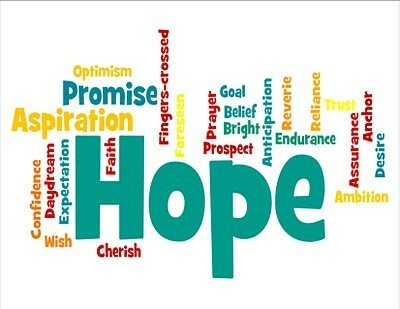 Hope has come and will come again.